Many retail stores have yet to introduce AI into their business. However, it’s worth looking at what impact this technology will have on the industry. This past year, artificial intelligence seeped into numerous facets of life. It seems as though no industry is exempt from this technology’s potential and those companies that implement AI are pulling ahead. According to Deloitte’s State of AI in the Enterprise 2018 report, 82% of early adopters of AI saw positive ROI. Revenues from the artificial intelligence for enterprise applications market worldwide is set to grow exponentially through 2025. One industry heavily investing in AI is retail. Retail spending on AI will likely reach $7.3B by 2022. There are many applications for enterprise AI in retail. And while most think about the online impact of AI, brick and mortar retailers have uses for this technology as well. Many retail stores have yet to introduce AI into their business. However, it’s worth looking at what impact this technology will have on the industry. Here’s a look at how AI will impact physical retail stores. As retailers know, loyal customers are the most valuable. AI solves the problem of getting those customers back into the store to buy again. Retailers have so much data to use to dissect buying patterns. Then, machine learning algorithms can predict future purchasing patterns of shoppers. Retailers can use this information to send offers on these products either online or by attaching specialised offers to catalogs. A completely personalised campaign will likely put the shopper back in the physical location because AI predicted what they would likely buy next and the offer gave them a nudge to go and buy the item. For most retailers, the first step is understanding what data they have and what they can do with it. Furthermore, with the introduction of GDPR, it’s crucial to understand whether or not data collection practices meet the standards. Personalised marketing campaigns are the end goal, but first stores need to collect and analyse data properly. Thankfully, there are a multitude of tools that can help retailers begin. The in-store experience is beginning to change, somewhat drastically, thanks to AI. Robots in retail stores are now a reality. Lowe’s is testing LoweBot, an autonomous retail service robot to help customers in the store and improve the employee experience. More retailers are considering in-store virtual clerks and even taking this technology to the next level. Gordon, for example, is a robotic barista in San Francisco that can serve 120 coffees per hour. Using AI in physical stores can also help customers navigate a large space and find products easily. For retailers just entering the AI space, it’s time to start thinking about how a virtual clerk or robotic assistant could help. This technology is still in its infancy, and still extremely expensive, but the next few years could change that. Retails can begin to think about how this technology could improve the buying experience in-store. Another significant change retails are making in-store is adding virtual reality (VR) capabilities. In this realm, Lowe’s again is taking the lead in new technology implementation. Lowe’s has a Holoroom app that customers can use to experience their home and even turn it into a YouTube 360 degree video. Users are offered either Oculus Rift or Google Cardboard to experience the room they designed and get a sense of what their new space will look like. North Face also takes a unique approach, adding VR into their retail spaces. Customers can take a virtual tour of California’s Yosemite National Park and the Moab desert in Utah and experience the incredible sights. These VR experiences help keep customers coming back to brick and mortar stores, as well as encourage purchases. VR tools such as Google Cardboard are now quite inexpensive. Developing the VR experience, however, is still costly. VR capabilities are becoming more and more commonplace, which means retailers should consider what experience to offer their customers. It’s this type of technology that will offer a brick and mortar store a competitive edge. AI makes inventory management easy. Giant retailer Target has a robot named Tally that can autonomously roll around the store and scan products to assess if they have been misplaced, mispriced, or are low in stock. Inventory management is another area where retailers can use machine learning to predict future needs. This ability minimises the possibility of having too much or too little of an item in stock. And for giant retailers trying to manage thousands of locations, this is a real cost-cutting tool. Inventory management really comes down to data management. 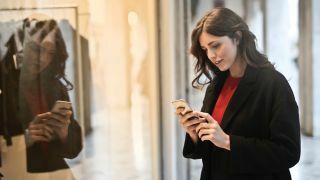 Retailers that undergo a digital transformation and begin to take a data-driven approach can use AI to ease common burdens like inventory management. A retailer’s nightmare is spending a lot on a new product just to have it sit on a shelf. And while retailers spend fortunes on research and development of a new product, it can still miss the mark. AI, however, can help make these predictions more accurate by harnessing the massive amount of data retailers already have. AI-powered data can help predict product success and avoid product failures by combining the already-collected data and using predictive algorithms. While this technology improves, retailers will still have to use their instinct and knowledge when buying new products. Data, however, can start to help retailers make better decisions that use past buying behavior as product success indicators. Retailers around the world are not only competing with each other but also with the movement of online buying. To keep customers in brick and mortar stores, retailers must come up with unique ways to get people to shop. AI helps improve the customer experience. Whether it’s from a fun, VR-powered game or from an AI robot to help people get around the store, retailers that implement AI technology in-house will see the results. There is also a pull from the consumer side as well. For example, 62% of shoppers are interested in trying virtual reality shopping. Retailers that capitalise on their customer’s interest, for instance North Face’s hiking experience, can pull more people into the store. And once these people are in the store, they are more likely to make a purchase. AI has many implications for online retail as well, but it’s a game-changer for brick and mortar stores that want to maintain their physical locations. Retailers that want to get started using AI in stores should take a step back and look at their data to ensure proper collection and analysation first.